Arizona wakesurf lessons is one of the fastest growing water sport activities for powerboats, and allows all riders the feel of catching the “WAVE” behind any inboard v-drive wake surf boat. Arizona Wakesurf Lessons are great for any age group, and generally is one of the easiest water sports to learn. The wake surf boat is moving slow, you have a large board to get out of the water, and the wave is pushing the wakesurfer. It doesn’t take much energy to wakesurf which makes it a relaxing sport for older guys who have given up on wakeboarding, and slalom skiing. Arizona Wakesurf Lessons has great instructors that have been trained to get you up wake surfing quickly, and start progressing towards carving, and butter sliding the wake. Here are some pointers before you come out on out private wakesurf lessons at Arizona lakes. With a skim board style wakesurf board, put your feet on the board like you were on a wakeboard or wakeskate. Place the board in front of you with the board sideways; both your feet on the wakesurfer. Use one hand to hold the wake surf board to your feet and the other to hold the rope. When you are ready, tell the wake boat driver to accelerate slowly. As soon as the wake boat starts moving, you can let go of the surfboard, and hold the handle with both hands. 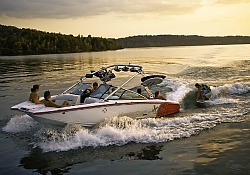 The force of the moving water will hold the wakesurfer firmly against your feet. Then Stand up slowly on the wake surfer. With a surfboard style board which is similar to a real surf board just a little shorter, put the wakesurf board in front of you with the board laying perpendicular to the boat. Lay back with your knees slightly bent, and put your feet on top of the wakesurfer; the wakesurf board will be floating on top of the water. Hold the rope and then tell the boat driver when you are ready. As soon as the boat start moving, push down with the heels of your feet so the board flips up flat against your feet. Once the wakesurfer is flat under your feet, stand up slowly. Once you get down standing up on your Utah wakesurfing lessons, you want to practice moving your feet around on the wakesurfer. Don’t worry if you continually move fast and hit the deck of the boat this is normal for most beginners, remember; if you move your weight on the front foot, the board will accelerate. Then if you transition your weight on the back foot of the wake board, it will slow down. Generally, you want to put more weight on the inside edge of the wake surf board, the side closest to the wave. This causes the inside edge of the surfboard to cut into the wave. On wakesurfing lessons in Arizona the goal is to be balanced on the wakesurf board, and then find the sweet spot of the wave that will push the board forward. Staying in this part of the wake takes practice, and very little shift in weight or position. Be patient when you are first learning or being taught by an instructor or teacher. Most people ride several times before they ride the wave. Just hang on to the handle and have fun. Carve back and forth, ride up and down the face of the wave, move over to the other side of the wake, attempt side slides, 180’s and 360’s. There is so much you can do while wakesurfing so have fun with it! Come out on your favorite lake with Arizona Wakesurf Lesson and try wake surfing charters and tours in Utah, New Mexico, Nevada, and California. Some of our favorite wakesurfing lakes are: Lake Powell National Recreation Area, Lake Mead, Lake Havasu, Lake Mohave, Lake Pleasant, Alamo Lake, Apache Lake, Bartlett Lake, Canyon Lake, Lake Martinez, Upper Lake Mary, Lahontan Reservoir, Lyman Lake, Lynx Lake, Patagonia Lake, Reservation Lake, Roosevelt Lake, Saguaro Lake, San Carlos Lake, Lake Henshaw, Lake Elsinore, Lake Arrowhead, Silverwood Lake, El Capitain Reservoir, Big Bear Lake, Pyramid Lake, Castaic Lake, Caballo Lake, and Elephant Butte Lake.